By now, your student has probably brought home a wall hanging depicting the five Kingdom Parables they have studied. In our synopses and discussions of these parables, we discovered the qualities of beauty, growth, and transformation in God’s Kingdom. Ask them to tell you about the parables–I think they’ll be happy to share what they’ve pondered on in the atrium! Following the liturgical calendar, we’ll be, of course, examining the Pascal narratives this month. The children listened carefully to the story of the Wolf and the Hireling on Sunday, and they had lots of opinions about the behavior of the hired hand. They drew conclusions beautifully about the Good Shepherd giving his life for the sheep; they talked about the wolf and the differences between Satan and evil. We were all saddened to discuss that we, as humans, have evil within us, and we talked about how to make that evil as small as we can. They’ll revisit the Cenacle and hear about the Last Supper, and they’ll look at a map of Jerusalem and identify important places pertinent to Holy Week. The week after Easter Sunday, we’ll read the scriptures telling of the empty tomb, and remind ourselves that Easter is not just one Sunday, but seven! The Catechesis of the Good Shepherd is the Christian formation program that is used at St. John’s for our children ages 3-12. It follows the educational principles of Maria Montessori. The children gather in an “atrium”, which is a special room prepared for them, which has beautiful handmade materials and items to teach our faith. This is a true formation program for kids that focuses on growing a child’s relationship with God through a purposeful engagement with Holy Scripture and liturgies of the Book of Common Prayer. The atrium environment is a prayerful “working space” that brings the Holy Spirit who is within the soul to direct children in growing a unique relationship with their heavenly Father. The program brings together two great tools of Anglican Christian formation: the Holy Scriptures and the Book of Common Prayer and our liturgical traditions. Anglicans are “liturgical Christians.” Our Christian life is nourished and developed using these tools of our faith. As adults we hear the scriptures on Sunday morning. We often take the scripture inserts in our Bulletin home so we can read them again and again, to more slowly hear and inwardly digest the Word of God. This method of learning allows adults time to meditate more deeply upon the life of Christ and perhaps speak to God in a thankful or hopeful prayer. But young children need their own way into God’s Word. The atrium serves this purpose. It provides the child space and special materials to ponder a biblical passage or become familiar with prayers from the Prayer Book. 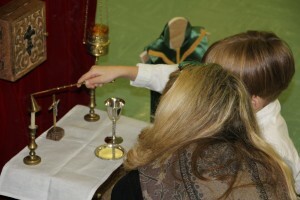 For example, children place wood figures of sheep in a sheepfold of the Good Shepherd and in doing this identify themselves as one of the sheep gathered with their Shepherd, or they set the apostles around a Last Supper table, or prepare a small altar with the furnishings used for the Holy Eucharist, or work with vestments and liturgical colors. Older children who do read will copy parables from the Bible, or lay in order written prayers from the rite of Holy Baptism, or label a long time line showing the history of the growth of the kingdom of God. Forming children and families in the historic faith is a principle goal of St. John’s Church, Fort Worth. Join us on Sunday morning and talk with one of our catechists about our program.